MyPasses is a utility that handles incoming Pass (Passbook) files. These files are used as movie tickets, electronic boarding passes and loyalty cards. Once the pass has been opened, the user can optionally add the pass to the Wallet application on the phone. Passes are stored in the application's storage in addition to the optional Wallet import. 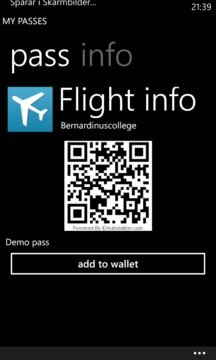 Note that this app is provided for interoperability with .pkpass files n integrate with the Windows Phone features such as the Wallet, not to accurately reproduce the look or additional update functionality of the passes - its main function is to display the barcode and other information within the pass, and use more Windows Phone style look and feel. 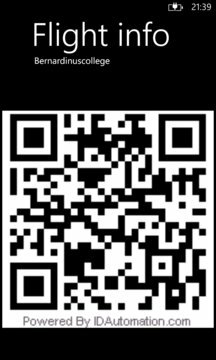 Be sure to check the "info" tab in the pass (barcode) page as all the textual pass data is shown over there. To retrieve the barcode from a web service, MyPasses requires a network connection. New in this version: support for additional languages, and better first use experience with a sample pass. Improved barcode fetching performance on the server. New in v1.1: Verified to work with LH boarding pass, updated app is able to open and show the contents. Also includes more reliable barcode functionality and stability improvements.